Kanjini Co-Op land consists of three lots making up the former 'Adler Hill' pastoral holding. As we have an abundance of land and have had inquiries from people who love the Kanjini vision but prefer to have private ownership of the land, we have elected to do a limited release of nine subdivision lots. These subdivision lots are magnificent lifestyle properties, some of which are also suitable as small commercial or hobby farms or as grazing blocks..
We have approval for the subdivision in two stages of four lots each, ranging in size from 75 to 255 acres. The eight freehold lots are all on the southern side of Emerald Falls road, before the public carpark of Emerald Falls itself. They are about 14-15 km from Mareeba GPO, of with about 4-5 km are unsealed gravel road. All lots are within 3 km of the crystal clear and picturesque Emerald Creek falls, with beautiful cool rock pools all year. The area has about 1000mm of rainfall and enjoys 300 sunny days a year and is one of the healthiest climates in the world. 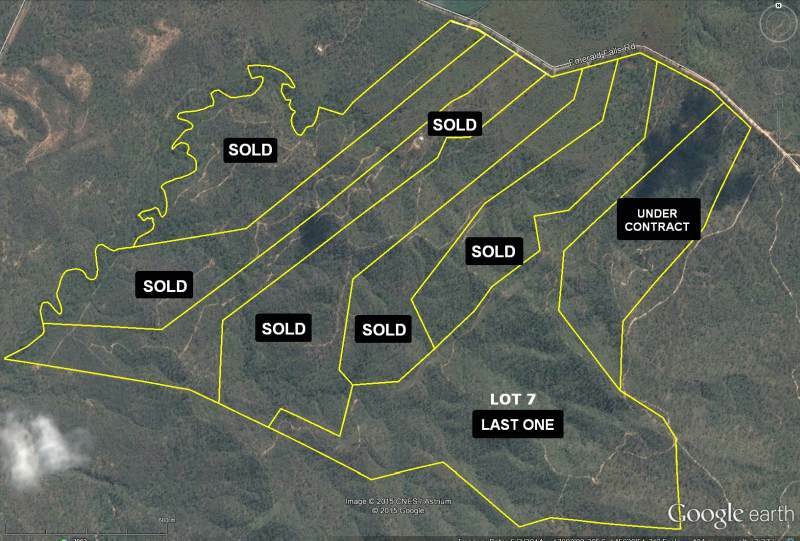 This is a unique opportunity for you to own your own wilderness block just 10 minutes from the center of Mareeba and only about one hours drive from Cairns and its international airport. You can choose from a wide range of sizes and features. The lots have all several acres of rich volcanic soil, all have great views either across the Barron river valley or onto the ranges and some lots have truly magnificent vistas and breath-taking long-distance views. Most lots have good dam sites, the first four have springs and/or permanent water holes and all have Ada creek transecting them which was still trickling at the end of the very long 2012 dry season. The vegetation is characterised by Eucalypts, Acacias and Grevilleas with some pandanus trees and paperbarks in moister gullies. Three lots border onto Ada creek in the back where you find big trees and beautiful river flats. Each lot has its own 4WD-track to access its hilly back country. Access is from the Cairns side of Mareeba into Tinaroo Creek road, turn left into Cobra road, which turns into Emerald falls road (unsealed). You will see our signs on your right, only minutes before you reach the popular Emerald falls carpark and swimming spot. Since this area is near World Heritage and is home to several rare and possibly some endangered species (for example quolls and bettongs), we have cooperated with council, Wet Tropics Management Authority and Queensland Parks and Wildlife to formulate conservation covenants. Some aspects of the covenants will cover all, other aspects will cover some parts of the subdivision lots. They formally acknowledge the vegetation restrictions reflected by the vegetation management act and restrict non-native animals. Dogs, cattle, horses, pigs and poultry are allowed subject to certain conditions, but cats, goats and deer are not. 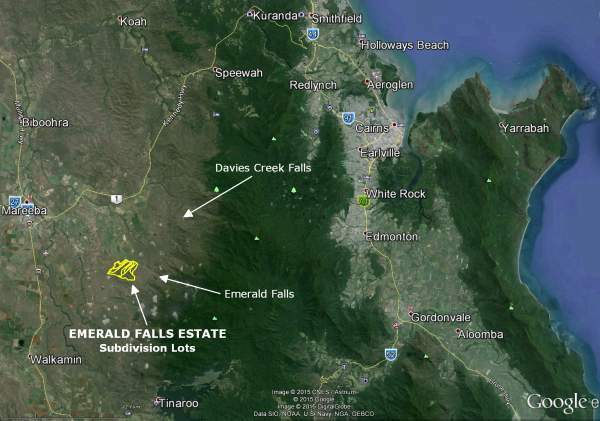 In the image on the top right, you can see where the subdivision blocks are in relation to Cairns, Mareeba and Emerald Creek Falls. In the image on the bottom right you can see the approximate property boundaries for lots 1 to 8 super-imposed onto Google-earth.